To evaluate maternal–fetal outcomes in women of advanced maternal age (AMA; >35 years old) and women of physiological maternal age as controls (C; <35 years old). Single-center, retrospective case–control analysis, from January 1 to December 31, 2013. 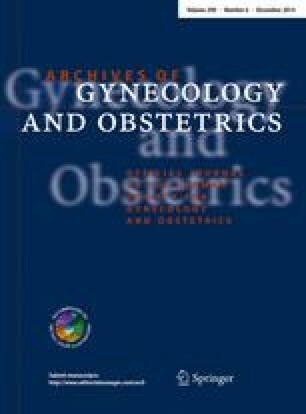 For each group, we evaluated obstetric history, number of twin pregnancies, delivery mode, incidence of obstetric diseases and neonatal outcomes (5-min Apgar score, neonatal weight, meconium stained fluid rate, admission to the neonatal intensive care unit rate, and incidence of congenital malformations). Data are presented as n (%) and analyzed with χ 2 test and Fisher exact test (when required). A p value < 0.05 was considered statistically significant. Moreover, we calculated the odds ratio (OR), with confidence interval (CI) at 95 %. We enrolled 1,347 pregnant women, 210 (15.6 %) in AMA and 1,137 (84.4 %) C. AMA patients showed a higher rate of previous (anamnestic) spontaneous abortion (SA; p = 0.001; OR = 2.10) and previous (anamnestic) voluntary pregnancy termination (p = 0.022; OR = 1.59), iterative cesarean section (p = 0.026; OR = 2.33), SA (p = 0.001; OR = 12.82), preterm delivery (p = 0.001; OR = 69.84), congenital malformations (p = 0.036; OR = 3.94). In C there was a greater number of nulliparous (p = 0.009; OR = 0.52) and vaginal deliveries (p = 0.025; OR = 0.41). There were not any statistically significant differences between the two groups for twin pregnancies (p = 0.862; OR = 0.97), first cesarean section (p = 0.145; OR = 0.95), other obstetric diseases and neonatal outcomes. AMA could be considered an important risk factor only for SA and PTD and does not influence neonatal outcomes except for congenital malformations. The authors are grateful to Sandy Maria Cartella for the language revision of the manuscript. All authors have no proprietary, financial, professional or other personal interest of any nature in any product, service or company.